A seriously ill horse who died in Spain earlier this month after a series of injuries and illnesses is suspected to have been suffering from the rare disease systemic calcinosis, of which only a handful of cases have been reported. An autopsy has revealed the two-year-old filly named Lily, who was cared for by the Easy Horse Care Rescue Centre in Alicante, had hard mineral lumps like stones in her neck, heart and lungs – a sign of systemic calcinosis. Only five cases of the illness have ever been recorded, all in the US in quarter horses and paints. Gross appearance of pale streaks within the gluteal muscle of a horse suffering from systemic calcinosis. Veterinarians at the Hospital Veterinario San Vicente, who treated Lily, have preserved the stones in formaldehyde to be sent to the University of Córdoba for further analysis. “We are obviously devastated to lose this beautiful young member of our rescue centre family, particularly after the loss of her mother only two years ago,” said Easy Horse Care co-founder Sue Weeding. Lily first fell ill in early July, after suffering a fractured neck overnight in her stable – foul play could not be ruled out, as the injury came as the rescue centre suffered a string of break-ins. Her condition continued to worsen over coming weeks, and Lily was diagnosed with tick fever and then an infection called myonecrosis in her neck muscles caused by the tick fever treatment injections. Despite treatment, she continued to deteriorate and was rushed to the Hospital Veterinario San Vicente on July 22. There, veterinarians discovered a mysterious lung infection. Cultures were taken but Lily died on August 10 before the results were revealed. Equine vet Dorothea and EHC co-founder Rod Weeding treating Lily. “This again highlights that while many of our rescued horses seem to be fine from the outside, they have been exposed to all sorts of unknown circumstances and situations that often leave a devastating mark on the inside. Sometimes it takes years for these effects to become known,” Weeding said. The syndrome in horses closely resembles a rare condition in humans called metastatic calcification or systemic calcinosis, as well as calciphylaxis. Systemic calcinosis is characterized by calcium deposition in the connective tissue of organs, including the lungs, kidneys, stomach, heart, and skin. All five horses studied had evidence of systemic calcinosis; as well as an uncommon feature of systemic calcinosis in humans, which was muscle fiber calcification. The five horses all presented with malaise, mild fever, stiffness, and loss of muscle mass particularly over the lumbar and gluteal area. Other common features at postmortem examination were dystrophic calcification of cardiac myofibers and renal tubules. No genetic mutations were found relating to polysaccharide storage myopathy (GYS1) and malignant hyperthermia. 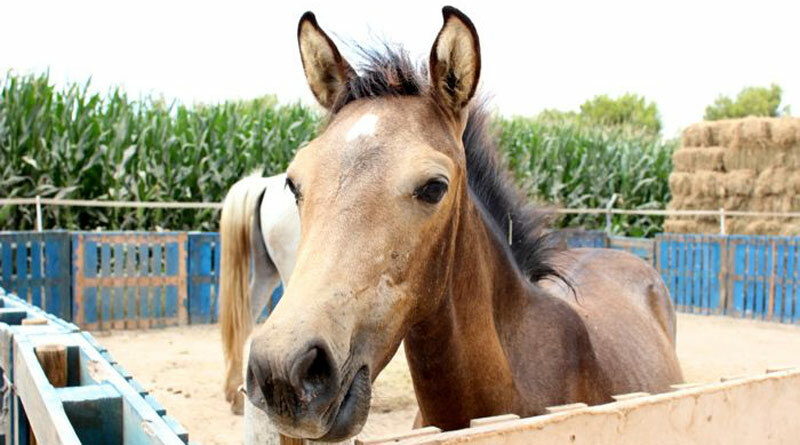 Lily was born at the rescue centre in April 2014 to an emaciated mare named Liberty, one of 14 horses rescued from Callosa de Segura just a month earlier. Weeding said Lily’s death had put the Easy Horse Care Rescue Centre under severe financial strain. While veterinarians have recognised the centre’s charity status and heavily discounted their bill, Lily’s treatment costs still came to €2650 – a huge sum for a centre that relies entirely on donations to survive. “We know we can immediately pay €540 of that, thanks to our wonderful supporters who have already so generously donated to help cover Lily’s costs. The rest we will have to pay off gradually in installments as we find the money,” Weeding said. Lily with Rosie, after Lily’s mum, Liberty, died. The situation was further complicated this week as a horse named Bettina – another of the Callosa de Segura 14 – fell seriously ill with colic and was rushed to the Hospital Veterinario San Vicente. She went immediately into surgery to remove a major intestine obstruction but could not be saved. “This has always been one of our worst fears, that we’d still owe the horse hospital a load of money from one case when another horse becomes seriously ill,” Weeding said. Weeding said the rescue centre would be grateful for any donations to help cover its veterinary bills.